These Dollar Tree Christmas Decoration Ideas will be sure to put more jingle in your pocket this holiday season! This year I’m excited to have all my family home for the holidays. With Mom, Dad and my sister staying here to celebrate I’m lucky to have my Dollar Tree. When everything’s a dollar I can still afford to bring in the Christmas spirit without being a scrooge. When it comes to cooking Dollar Tree has just about everything…except the turkey. From the basic ingredients like flour and sugar to bakeware like these foil pans. Last year I spent hours soaking and cleaning dishes. Not this year. I’ll be spending those hours with my family around the Christmas tree. Dollar Tree even carries Betty Crocker ! My sister saw all my Betty Crocker gadgets last time she was in town and she loved them; so guess what she’s getting for Christmas! Did you know Dollar Tree also has a website? I can order online and have my items shipped to my Dollar Tree store for free, all at my own convenience. I also go to DollarTree.com for great ideas on creative ways to save for the holidays, like these Reindeer Cupcakes and Pint Jar Cookie Gifts! They even have printable labels. With my kids on Christmas vacation I always look for ways to keep them entertained. We had so much fun making these. Growing up my Mom always did a great job decorating the table for Christmas. Now it’s my tradition and I can do it on a budget. Everything here is from my Dollar Tree! You don’t need to pay department store prices to get this high-end look. We’ve started a new tradition this year. We went to Dollar Tree so my kids could pick out their favorite toys to add to the care packages we are making for our church. Little did they know they were also picking their stocking stuffers. Dollar Tree is great for stocking stuffers and care packages. It’s the season for giving and at only $1 we can give a lot more. If you bought new Christmas decor every year can you imagine how much that would cost Here’s a tip. Adding a little can really look like a lot. 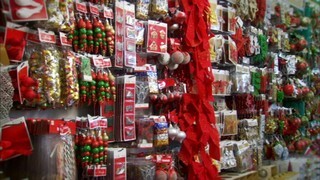 I just picked up a few new favorites to add to my already elegant Dollar Tree Christmas Decor. I already had red ornaments so adding some silver ones makes my whole tree feel bright and new. Dollar Tree is always my FIRST stop for Christmas. Why spend more at other stores when Dollar Tree has such an amazing selection and affordable price. Dollar Tree also helps me save on wrapping so I can spend more on the gift. If you’re spending more than $1 for wrapping, bags or bows…you’re spending too much. They’re here. Remember the one gift that will out last all the others is great memories, and Dollar Tree can help make them. Merry Christmas!